There is a high value printable Finish coupon available (as well as a few other coupons). Go here and click on the “Coupons and Offers” link on the lower right hand side to access these. 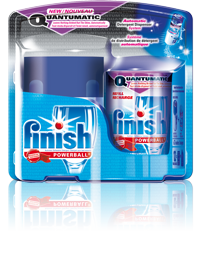 The coupon is valid for $3 off any Finish Quantumatic Detergent Dispenser System. I’ve also heard these may be on clearance at Walmart. Let us know if you come across any in-store deals or if your Walmart has this on clearance!